I am often asked – What are the best conditions to fish? My instinctive reply is something along the lines of – whenever you have the time. Of course, the reason for this flippant answer is that I have a fishing addiction and I will grab a rod and line at the drop of a hat! Having said that, fish, being the finicky creatures they are, are subject to a host of environmental pressures and variables every moment of their lives. Their respective behaviours are therefore intimately tied to these external factors. In order to be a successful angler, it is important to be aware of these factors and plan your fishing trip accordingly. It may seem a bit overwhelming at the beginning, but don’t fear; the more you fish, the more you will become familiar with the world the fish occupy and your knowledge about these conditions will also improve rapidly. It will also give you an opportunity to learn more about the fascinating planet we inhabit along with all the different species of fish. These topic areas are by no means exhaustive, so feel free to add any additional thoughts in the comments below! Fish, like humans, definitely don’t eat non-stop the whole day long. Like every other living organism, fish are also subject to rhythmic cycles and there are definite periods during each day when they feed actively. It is obviously not easy to work out exactly when those times are, but through my many years of fishing and observing the habits of fish, I have come to some conclusions. Firstly, most fish species go into a resting period during the dark hours of the night. Obviously, it differs from species to species some predatory fish prefer night time feeding. But, as a general rule, most fish species tend to take things easy during the dark hours. It naturally follows that by dawn, they feel pretty peckish and that’s why early mornings still remain one of my preferred times to go fishing, regardless of the species. The same goes for late afternoon/early evening. Before darkness descends, it seems that most fish species are on the lookout for an early dinner or something substantial to sustain them during the night. This applies to both predatory fish and prey species in my experience. Therefore, when planning your fishing trip make sure to include at least one of these time periods during the day. Water clarity affects different species in different ways. For example, freshwater species like catfish and carp don’t mind muddy waters at all, in fact, they seem to relish it. It obviously has something to do with the way they have evolved over the many eons allowing them to occupy their respective niches in nature. They are very talented, being able to successfully detect their food source in water where the visibility is almost zero. However, for certain predatory species like bass and trout, water clarity is of great importance. You can easily see why if you compare the size of their eyes with the carp and catfish. Both bass and trout are hunters and, apart from picking up vibrations from their potential prey, they very much rely on their eyesight to catch it. But even for predatory species, water that is too clear can be a problem. It removes the element of surprise. Also, if you can see them, chances are pretty good that they can see you! This ties in with my previous comments regarding fishing at dawn and dusk. During those times of the day, the sun’s rays enter the water at an angle and, although the water is still clear, the angle of the rays create different hues and shadows allowing predatory fish to sneak up on unsuspecting prey and surprise them. Therefore, if you are confronted with a well-lit area of a river, pond or lake, consider moving to a deeper area or a different spot well hidden from direct sunlight. Under cover of trees or an embankment will do very nicely. As cold-blooded creatures, fish don’t have the luxury of a regulated body temperature compared to other warm-blooded creatures including us humans. Therefore, varying temperatures can have a dramatic effect on the behaviour and activities of all kinds of fish species. Fish have a definite comfort zone – a window of minimum and maximum temperatures where they operate optimally. Once the temperatures rise or drop outside of this comfort zone and become too cold or too hot, the fish become lethargic and disinterested in taking the bait no matter what kind. 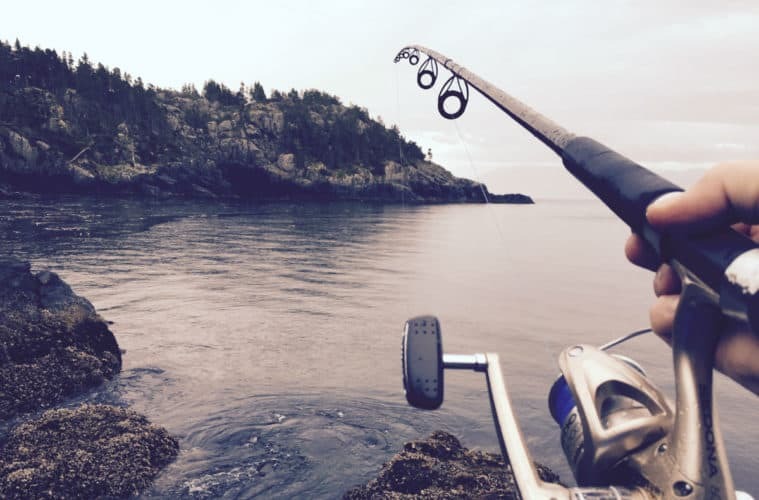 Even if the water temperature drops dramatically within the extremes of a particular fish species comfort zone, the fish may experience discomfort which can result in a sparse and uneventful fishing day. Therefore, when heavy rains result in a sudden influx of fresh, cold water into dams, ponds, rivers or lakes, you can expect the water temperature to be affected creating adverse fishing conditions. A gradual change in temperature over a period of a few days doesn’t seem to trigger a dramatic change in behaviour. This is probably because the fish then have more time to acclimatize. On the flip side, colder water contains more oxygen and during long hot summer months the water temperature in a closed body of water can rise to such a degree that fish can become sluggish because of the reduced amount of oxygen in the water. When this is the case it is always prudent to seek out deeper fishing spots, because that is where the water will be cooler. This in turn, will increase your chances of being successful. If fishing a river, focus on the fast water and rapids – areas which will be well-oxygenated due to constant water movement. It is definitely not a bad idea to take a thermometer with you on a fishing trip taking random tests of the water you are about to fish. Take note of the temperature and compare it with the number of fish you caught. This can greatly add to planning a successful future fishing outing. When fishing in the ocean there are other variables to be taken into account. Sea currents for example. These currents, aided by wind and wave action, are constantly shifting vast volumes of water from one location to another. If you are fortunate enough to fish a specific area over an extended period of time you will gradually get an insight into which prevailing winds and currents play a dominant role in creating seperate pockets of water where fish will hole up during adverse conditions. Bright sunny days may be good for a stroll along the beach or for soaking up the sun, but generally, they are not good for fishing. Overcast days with a light breeze rippling the water surface improve your chances of catching a fish dramatically. Sounds pretty obvious, but I believe there is more to this stoic observation than meets the eye. For an outdoor pursuit like angling, the weather is obviously one of the main concerns for fisherman. Even the best-planned outing can end in disaster if the weather turns bad on you. However, not all bad weather conditions may be necessarily bad for experiencing good fishing. Allow me to let you in onto this little secret. One of the fascinating biological facts about bone fish species is that they possess a swim bladder. Some evolutionary biologists theorize that those early swim bladders eventually evolved into lungs of earth dwelling vertebrates after our ancient ancestors decided to leave the ocean for terra firma. Be that as it may, the swim bladder not only plays a vital role in, amongst other things, the movement of fish (especially vertical movement in the water column), but, in my opinion, it also dictates in a big way the feeding patterns of most fish species. Because of its sensitivity to outside pressures, most bonefish species seem able to detect variations in weather patterns caused by atmospheric pressure. In my experience, if a cold front is moving into a certain area the best time to go fishing is the day before the barometer starts dropping. Once the barometer drops dramatically, most fish species that I hunt for will go off the bite. As long as the bad weather prevails and the air pressure remains relatively low, conditions for fishing are poor. But now comes the interesting part and the reason why I would urge every aspirant (and seasoned) angler out there to invest in a barometer of some sorts. Even though the weather remains miserable after a couple of days, if the barometer starts rising you are good to go. Again, there is some controversy amongst anglers what the reason for this behaviour may be, and, although I am neither a meteorologist nor a fish biologist, I am almost certain that the fish can detect those subtle changes in the air pressure via their swim bladders. Whatever the science behind this phenomenon, rest assured, that when the barometer starts rising again, you can go fishing with confidence if you don’t mind a bit of cold and wet. In closing, I just want to emphasize that fishing is definitely not an exact science. I have fished during favourable conditions with not much luck and I have also made surprise catches when, in my opinion, conditions were not great for fishing. Bottom line is, whenever the opportunity presents itself, go fish but always be aware of the factors as mentioned above. Make notes, either mental or otherwise and build up your own archive of knowledge about the best times to catch a fish. Tight Lines! If you enjoyed this post, hated this post or just have some other points you’d like to make then feel free to post them below! Very useful advice, Johan, and interesting info on the lives if fishes.